I had all the best intentions of working down my WIP list. Its getting a bit out of control as there aren't enough days in the week to figure out a rotation when you have 12 different things going, but I had a few things to do that made taking even my Bent Creek mini's difficult to bring along so I dug this little scissor case out and did some work on it. I should have this done today if I can work some time into the day to work on it before I get home tonight. I have been working diligently on assembly in the evenings. 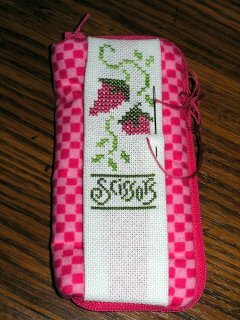 I almost have the base of mom's Shaker box complete, and I've decided since I am missing on my stitching time to work on her project that I gave her my class piece to do some of the stitching on that for me in trade. Now I really need to start working on all those projects in my pile of started projects, I have a ton of things I want to start but I really need to get the ones I have going finished first. Dratted priorities! You have some great wips going there Kim. Maybe you can concentrate on just 2 or 3 for awhile to get them finished, then work on a few more - before starting anything new. That's the hard part - there are wayyyy tooooo many great designs, lol!